This Monkeyflower has stunning red flowers that stand out against its foliage. 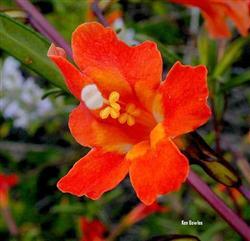 Red Monkey Flower (Mimulus aurantiacus var. puniceus) is a small shrub that can be seen growing all over our state, but most commonly closer to coastal areas. It grows to about 2 feet high, with dark green leaves, and bright red flowers that are adored by hummingbirds. In conditions where it is most suited the spring flowering will actually last into summer It is best planted in full sun in coastal areas and light or part shade inland. Deadhead to encourage more flowers and trim back more aggressively after the flowering season to encourage fuller growth next season. Monkeyflowers naturally like to go semi-dormant in the hot summer weather, so do not do direct summer watering, and wait for new growth in the rainy season.